After a little break we continue the interview series, and I am happy to tell you that I was able to get in touch with a few more interesting companies who have agreed to participate. Today we will once again make the hammocking community very happy, as the interview is with Tom Hennessy from Hennessy Hammocks. 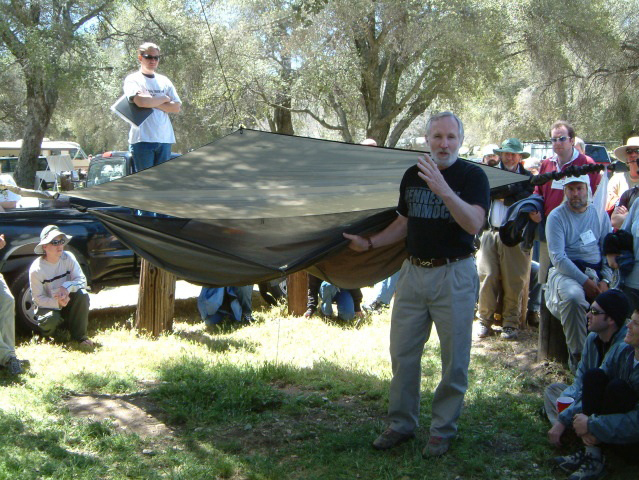 Tom doing a hammock demo at the PCT kick-off. I attribute my love of the outdoors and of camping gear to my mother. I was the oldest of five kids and was 12 years old when my mother would first take us all on a two or three week camping trip every summer to beaches, mountains, rivers, lakes from North Carolina to Canada. My mother and I were responsible for selecting gear for our adventures and in the late 50’s, the best deals for camping gear were in the army surplus stores, so each year we would go searching for new stuff. On one of our forays I found a box of WW II surplus hammocks. They were only about 8 inches in diameter and 10 inches long and had a label that said “Military Jungle Hammock”. Without opening it, I decided to take one for $3 and give it a try. On our next camping trip, I set it up and instantly fell in love with it and decided I would never sleep on the ground again. Although I loved camping and getting out into nature, I did not look forward to the roots, the rocks, the puddles and the almost never level, sloping ground under the tent. My most panicked experience in a tent, when I was 8 or 10 years old, was waking up at 3:30 in the morning with my face jammed into the lowest corner of the tent because I had slid down the slope in my sleep. At the age of 16, I would make 200 mile, weekend bicycle trips out of Washington D.C. into the Appalachian Mountains. I carried a minimum of food & water, a light sleeping bag and my WW II surplus U.S. Army jungle hammock. I loved this old thing because it rolled up so small and weighed so little and had no poles or stakes, perfect for moving light and fast. 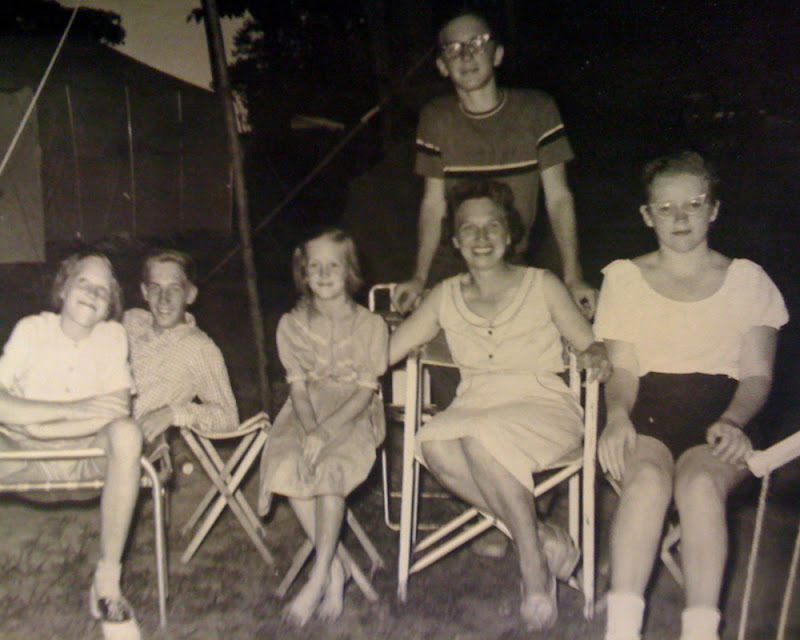 Dorothy Hennessy on camping trip with 5 kids - Tom is the second from the left. I try to do one or two shorter trips in the summer in British Columbia and when it is too cold in BC, I like to hike in New Zealand. In the last three years, I have also done two hikes with the factory team in China. I have hiked in the Olympic peninsula in Washington State. There are also a couple of short trails on Galiano Island where I live. In New Zealand, my wife Ann and I have hiked on the Abel Tasman and the Routeburn and we also hike on Stewart Island where I do my design work in the winter. 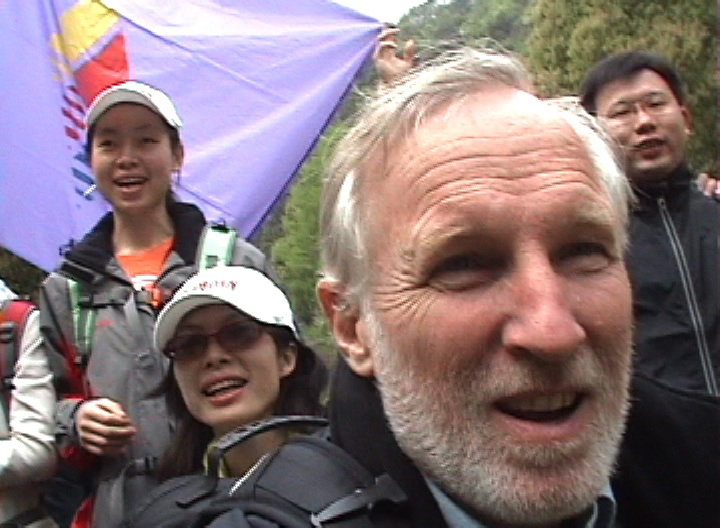 Tom on camping trip with the production team from the factory in China. Are you a lightweight/ UL backpacker? If so, what is your typical base weight? Yes, definitely – ultralight backpacker. I have always been obsessed with weight. As a kid, I had to have the lightest fishing rod, the lightest bicycle… My base weight is under 10 lbs. 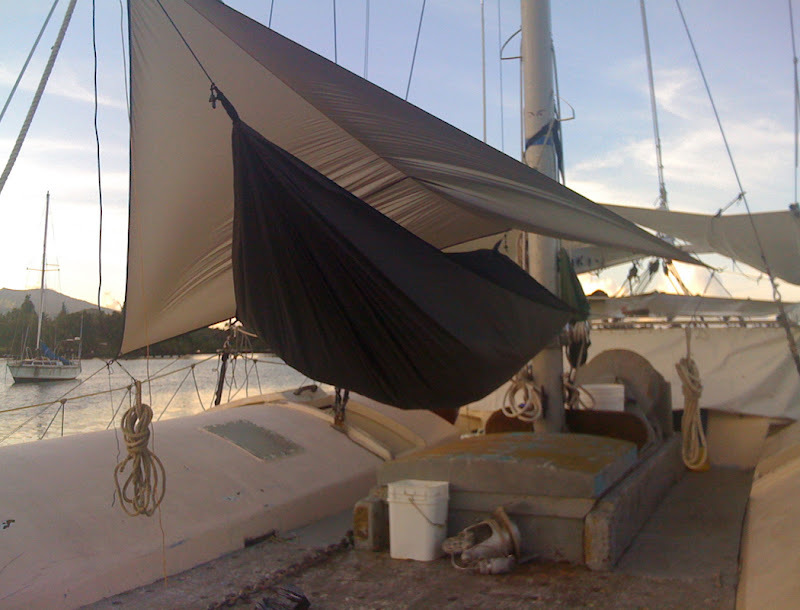 Hennessy Hammock sells a lot of different gear, from hammocks and rainflies to ponchos and insulation systems. Can you tell us a little bit about the beginnings of Hennessy Hammock, the birth of your hammocks, and how it developed over time? At university, I loaned my army hammock to a "friend" who never returned it. As the years passed, I continued to miss that little piece of gear and finally decided to duplicate my old army hammock from memory during my winter vacation. I purchased all the materials in Vancouver B.C. and flew to Florida to visit my mother, who had taught me to sew when I was 10 and still had her original 1949 sewing machine. The duplicate of the army hammock took less than a day to finish. As I was cutting and sewing, I began to see ways to overcome some of the army hammock's shortcomings. The prototype needed to be more spacious inside to eliminate any sense of claustrophobia. It needed to be wider to allow resting or sleeping on the diagonal without curving your back. The netting had to be increased to improve air circulation and the weather fly needed to be adjustable and removable to create an open and airy feeling during good weather and yet close up for protection at night or during inclement weather. The rectangular army shape evolved into a sleek diamond shape; the cord assemblies at each end disappeared to create more interior space by attaching the hammock fabric directly to the suspending ropes. A ridge line was built into the hammock providing a support for the netting and weather-fly and, more importantly, ensuring that the hammock would set with exactly the same curve each time it was set up. Hammock with insulation at Dionisio Park, Galiano Island. And the most amazing feature - the side zipper was eliminated and replaced with a zipper-less entrance through the bottom of the hammock which snapped closed automatically, activated by your own body weight, as you lift your feet up through the entrance. Finally, a velcro was added at the entrance to provide a tight, overlapping seal. Over the next six years I made over fifty different prototypes for my ventures into the Everglades, Costa Rica and Mexico. This project started out as a personal design challenge. I originally had no intention of going into the business of selling hammocks. I just wanted to make the best, lightest, most comfortable and inexpensive hammock that I could possibly dream up. After six years of designing, sewing and travelling I wanted to wrap up this design project, I decided to go back to Florida. I rented a van, bought two sewing machines, picked up a piece of plywood at a building supply, drove down to Key Largo and set up in the camp ground where the Winnebagos park to have access to power. I pulled the plywood out of the van, put it on the picnic table, set up the two sewing machines and plugged them into the power plug on the tree. In the morning, I would cut out an improved model, in the afternoon I would sew it, assemble it and then sleep in it that night. Each morning I would make a note of all the little adjustments to make it a little more comfortable or a little simpler or lighter. Then I would start again, cutting, sewing, sleeping in the hammock. I did this every night and day for two weeks straight. The Winnebago campers were always stopping by to see the weird gadget that was changing every day. After two weeks of fine-tuning, I realised I was finished with the design. I couldn’t find any way to make it lighter, simpler or more comfortable. Up to that point, I was working on this as a personal design problem that connected me to my childhood and the outdoors. Then I began to think that this was something that could be marketed and that other backpackers might enjoy as a substitute for a tent. I found the pay phone in the Key Largo campground and with much persistence, got through to the tent buyer at REI. I told him that I had a new piece of camping gear I thought they might be interested in and asked if I could stop by on my way through Seattle back to Canada to show it to them. The answer was “Just mail us one – we’ll take a look at it and let you know if we’re interested”. I said “Hey guys, I’ve been a member of REI for 30 years, I think it’s a great company, I buy all my gear from REI and I would like to give REI the first opportunity to sell this product. If you can just give me two minutes of your time, you can tell me to go away or come back. If you don’t want to carry this product, I will show it to my second choice.” The guy said “Oh, all right – be there at 2 pm and I’ll have a look at it”. Because we did not have any other stores or distributors, in 1999 we decided to start a web page, so we bought a $30 web authoring program and a domain name and started selling hammocks online. A web site is one of the best first things a small home-based business can do to find a market before they move into bricks and mortar retailers. Because of all the feedback we have received from users, our website has grown to about 130 pages of tips and information. We started manufacturing our hammocks in Everett, Washington and did all the assembly and packaging at our shop on Galiano Island in Canada. We still produce small runs of some products in the US and Canada, but after a couple of years our US manufacturer could not keep up with demand so many of our most popular models are now made offshore. Our shop on our property in Canada is for prototyping new ideas and doing all warranty repairs and general maintenance for our customers. Our commitment to quality means that all of our ropes and some other crucial parts are manufactured in the US and sent to the factory in Shanghai. Just as important, we spend a lot of time at the factory, inspecting every single hammock before it is packed for shipment. Customer safety is our most important concern. 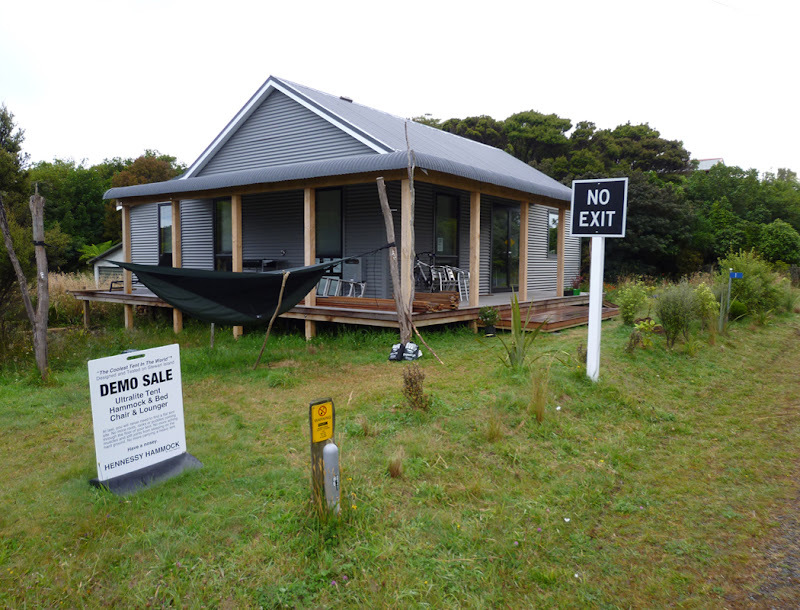 Hennessy studio on Stewart Island, New Zealand. Tom, we love to be let in on the work-in-progress stuff! Can you let us know a tiny bit on what kind of new products you were working at down in the New Zealand design studio? I do some of my best designing when I can slow down a bit in the New Zealand summer which is the BC winter. Our studio on Stewart Island is on the road which leads out to the trail head for three different hikes in Rakiura National Park. Stewart Island hangs off the bottom of New Zealand and is one of those places which is kind of at the end of the earth and some of the most dedicated hikers in the world pass my studio on their way to the trail head each day. They often stop by to look at the hammock, discuss hammock design and camping gear in general. I get some of the most interesting suggestions from these intrepid travellers. Just recently, one suggestion was to improve the Supershelter 4-season insulation system, making it quicker and easier to attach and remove. This system also has been tested by the British Royal Marine Commandos north of the Arctic Circle in winter. We have also just released our new catenary cut silnylon rainflies that convert into a poncho. We decided instead of putting a hole for your head through the middle of the rainfly, we just added a light weight jacket zipper to one long side – this does not compromise the integrity of the rainfly and provides a substitute for a rain parka which also serves as a pack cover. The Cat Cape also provides ample ventilation, eliminating annoying condensation which can build up inside of some rain suits. This year, we are working on a set of leggings which will be an accessory for the poncho and which will prevent rain from soaking your pants when it runs off the bottom edge of the poncho. These will be height adjustable, provide more ventilation than rain pants, weigh in at a couple of ounces, and be very inexpensive. Another product that I have been developing is our new Monsoon and Typhoon rainflies. This storm system was born from an experience I had with my hammock on the deck of a big catamaran in Tahiti where I had stopped off on my way back from New Zealand to help a friend prepare his boat for a return trip to Canada. At two o’clock in the morning, I was fast asleep as a violent storm crossed over the harbour and a lightning bolt flashed about a half a mile in front of the boat. The flash was so intense that it came through the rainfly,through my closed eyelids and seemed to light up the inside of my skull like a 1000 watt light bulb. A half a second later, came a crack of thunder and then a pressure wave of water and air struck the hammock and dumped at least a gallon of water under the fly and right through the net, leaving me in a puddle of water with a drenched down bag. I spent the rest of that night below deck trying to figure out what I could do to prevent that from ever happening again. The solution was a modified shock corded “hex” fly with “blast” panels attachable to each end of the fly to create a totally enclosed space that could handle almost anything. I imagined this would be used for serious expeditions to remote areas where survival is the name of the game. We’ve also had a request from a famous company to design a hammock specifically for motorcyclers who would like a larger fly with an extension on one side of their hammock to cover their motorcycle. The most significant new addition to our line is the choice of purchasing a Hennessy Hammock with either the Velcro bottom entrance or a zippered entrance. Originally Hennessy Hammocks were of interest to early adopters looking for new exciting developments and innovation in outdoor gear. Now it appears that our hammocks have developed a reputation which has crossed over into the mainstream, attracting a larger following and moving us to offer an increased number of choices. Many people told us they liked the bottom entry hammock a lot, but wondered if we would be interested in making one with a zipper. We now offer Hennessy Hammocks with a choice of Velcro bottom entrance or zippered side entrance for the same price. We have also recently introduced our first double-bottom hammock which is named the Deep Jungle because the two layers of tightly woven fabric make it absolutely 100% mosquito proof. As most people know, a mosquito can bite through one layer of almost any fabric – we developed this model for Ed Stafford who recently competed his full-length walk of the Amazon for the Royal Geographic Society. In his report he mentioned the Deep Jungle as the most valuable piece of equipment he carried. The Deep Jungle also uses a specially designed, inexpensive radiant reflective bubble pad for insulation. This model is now also available for people over 6 ft. and up to 300 lbs as the Deep Jungle XL. For years, we have been working on a quilt for the Hennessy Hammock, but have not released it yet. Our 4 season insulation system is so warm that I often find it unnecessary to have a bag in the hammock and usually unzip the bag and use it as a large quilt over me. Another thing we are getting very interested in is a new design for a lightweight backpack which is another personal project I find very exciting. How works the R&D at Hennessy Hammock, do you have a need yourself that you try to fix, or do some of your clients inspire you for new products or ask you for solutions to their problems? We do both. I was trained as an industrial designer but even as a little kid I was making things in my basement and going across the street and knocking on the neighbour’s door trying to sell them. I am always looking for lighter, better, faster, cheaper ways to do things. I have decided to make my quest for the perfect hammock my contribution to the camping world. I eat, sleep and breath hammock design. When I am looking for an answer to a hammock design problem, I ask my brain to go to work on it. Sometimes the answer comes back in a day or a week, sometimes it’s a month or a year later when I get a eureka moment at 3:30 in the morning. I sit bolt upright out of a deep sleep and the answer is there. The only worry is getting it down on paper before I forget. 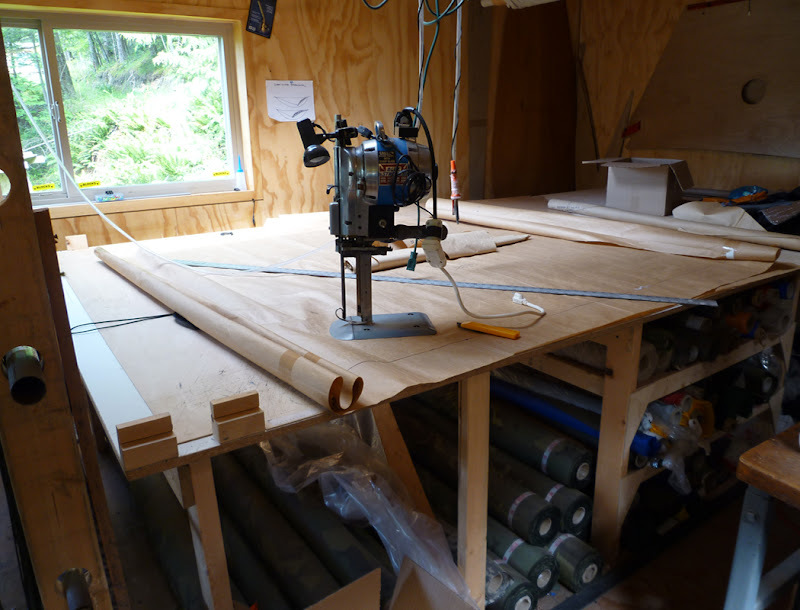 Cutting table at the Galiano Island studio. For example, most North American hammock users lay with their head at one end and their feet at the other end and their back bent into the curve at the bottom. Soldiers came back from WW II telling everybody that you can’t sleep overnight in a hammock without wrecking your back. That is because their lower spine would reverse curvature when their muscles relaxed and it would take about an hour for their back to return to normal in the morning. I knew that the Mayan Indians of Central America always slept on the diagonal making the hammock conform to their anatomy and giving correct support to their lower back. So I designed and patented a hammock which was asymmetric and provided more usable space and at the same time increasing comfort. In the early days, our customers asked us for larger rainflies and we responded – in fact, on some models you can get an oversized rainfly as a free upgrade. Our new Zip models are in response to customers who said they would like to have a choice. Our Cat Cape eliminates the need for a rain jacket or pants. These are all responses to customer requests. The new leggings are coming soon are a reflection of my own need to keep my pant legs dry when using the Cat Cape. What is the most sold piece of gear from Hennessy Hammocks? Also, where do your customer come from? The Expedition Asym is our most popular model. It is sturdy, lightweight, economical – it’s a great entry model hammock with all of the patented features at a very affordable price for anyone up to 6 feet and 250 lbs. Almost all of our customers come from word of mouth. People send us amazing emails about their experiences, post videos on YouTube and write to chat groups. People who are using our products are out on long and short trails. We get emails from hikers who are finishing the AT or PCT, telling us that they demonstrate the hammock to fellow hikers, sometimes two or three people every night for months and have told us they are happy to do it and that if they haven’t sold a hundred for us they haven’t sold a single one. This question reminds me of a phone call we got from a mountain top in Virginia – the caller told us he and his friends had just seen our hammocks the night before in a campground and were not carrying their six pound tents another 585 miles so please send 3 Fedex Overnight to the next town post office. We do almost no advertising but we do run a small ad in Sea Kayaker Magazine because it’s local and we really admire what they are doing. 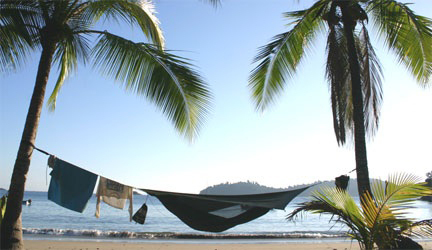 Beach camping at Coiba National Park. 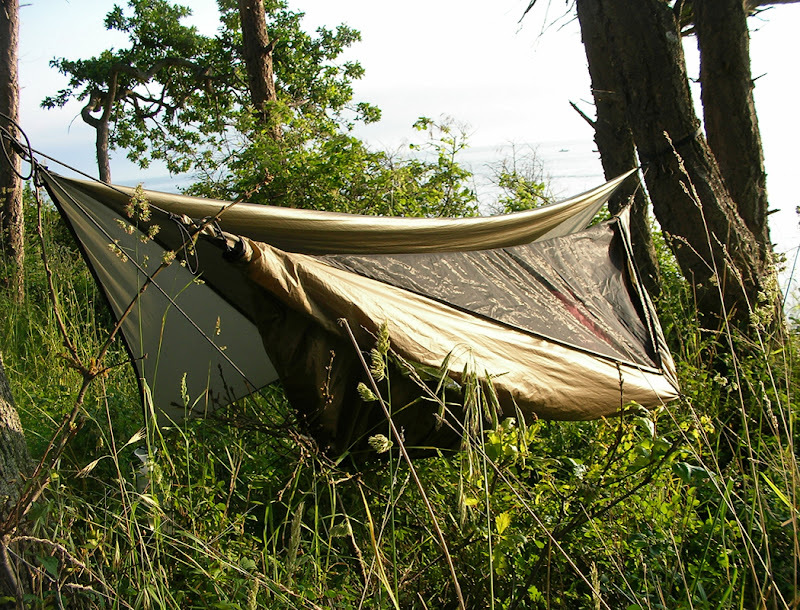 Are you in touch with other cottage manufacturers from the hammock/ ultralight backpacking scene? A group of us get together for a meal during Trail Days at Damascus, Virginia, including Ron from Six Moons Designs, Grant from Gossamer Gear, talking about pack design, and Russ from Trail Designs, sharing ideas for stove designs. We have chats with Jacks 'R' Better and Ed of Speer Hammocks at Trail Days, as well as most of the other gear manufacturers at the show, including talking about fabrics with Ron from Mountain Laurel Designs. Ron Moak was one of our first contacts and was very helpful in getting us involved with the PCT hiking group. Brian Frankle from ULA has been very encouraging over the years as the Hennessy Hammock developed. Since I spend some time in New Zealand, I converse with Aarn from Aarn Body Packs as some hikers use both of our gear. Grant of Gossamer Gear designs make some of my favourite packs. What is your own favourite backpack, sleep system and shelter? What about your favourite hammock and tarp? The Hyperlight with the Supershelter 4 season system underneath and the Cat Cape catenary cut rainfly/poncho is my favourite lightweight hammock set-up. My Hyperlight weighs 1 lb. 9 oz., my insulation system weighs 16 oz. The Cat Cape rainfly for my hammock also doubles as my poncho, which effectively adds only the weight of the zipper which is about 1 oz. I have a 50 degree Feathered Friends bag which I modified into a quilt that I use down to 30 degrees because the radiant feature of my insulation system is so effective. I also have a Mountain Hardwear 30 degree down bag. I use a Gossamer Gear Mariposa pack. When and where was your last longer backpacking trip and what was your base weight? Are you planning to get out for a trip soon, and enjoy the late winter season in Canada? At 67, and because my wife and son James and I are so busy keeping our business going, not to mention my knees which are starting to complain, in recent years, I’ve limited myself to hikes of not more than a couple of days – 3 or 4 - and have avoided winter camping by fleeing to New Zealand when it starts to get cold. I used to be a distance runner so I usually move a bit faster and go a bit longer each day - my last 3 day-rated hike in Rakiura National Park took me a day and a half. That is because I did not have to stop at the huts in the middle of the afternoon because the next hut was too far. I could just keep going until dark, set up my hammock at the first set of trees off the trail and be gone early in the morning. If time allows, I’m hoping to do a section of the PCT from the border at Manning Park going south for a few days. This will depend on fitting time between the Outdoor Retailer Show and the 10 day National Jamboree at Fort A P Hill to show off the hammock to 40,000 Boy Scouts attending the 100th anniversary of Scouting. Do you think ultralight backpacking and hammocking will become more popular and break into the mass market, or will it continue to be something for a small group of people? As I mentioned earlier, our hammock seems to have already moved into the consciousness of the mass market. A couple of years ago, one of the top guys at Eureka came to my booth at the Outdoor Retailer Show, put a hand on my shoulder and mentioned that their company had lots of money and maybe I should come and talk with them. I replied “Thanks anyway, but I am still having too much fun.” Eureka has since come out with their own design. So yes, the big boys are gearing up to scoop some of the action. We are amazed by the variety of people who use the hammock, including people with arthritis and back problems. As the baby boomers age, doctors are telling them they can’t carry heavy packs any more or sleep on the hard ground so they are looking for alternatives. Hammocks fill the bill beautifully. Hammock camping has put these people back on the trail. One of the reasons hammocks are moving into the mass market is the increase in the number of manufacturers. When we started out there will only 3 manufacturers of camping hammocks and now there are more than a dozen with good products on the market, offering a wide variety of designs. This benefits everyone, customers as well as manufacturers. Tom, I thank you for taking the time to answer my questions =) Is there something you would like to add? I really appreciate this opportunity to answer your questions about Hennessy Hammock. It is an honor to be included amongst such an esteemed group in the ultralight backpacking world. Lite hikes and restful nites!